Its time for winter sports. There’s soccer most Saturday mornings at the school and netball teams go “overseas”. 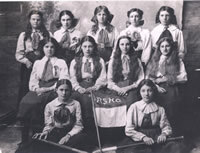 This undated (about 1910) photo shows Russell School Hockey club with their white blouses, serge skirts, neck ties and flowing hair. The girls are (back row left to right) Amy Fuller, Irene Acheson, Muriel Anderson, Kathleen Irving and Ella Williams. Middle row: Mona Bisset, Violet Moran, Moina Anderson, and Rosalie Wood. Front row: Amy Bullen, and Eliza Moran. Another photo from 1910 says they defeated Kawakawa School in a game. Let’s hope the Russell teams of 2007 have a successful season.